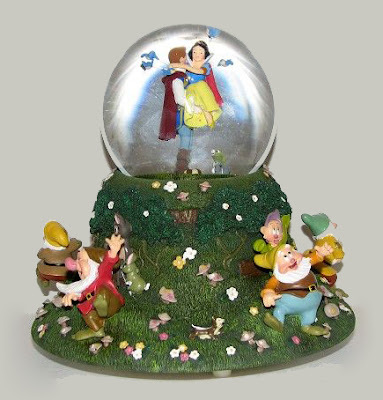 A Snow White snowglobe from the Disney Store. Resin and glass. Plays Dwarfs' Yodel Song. 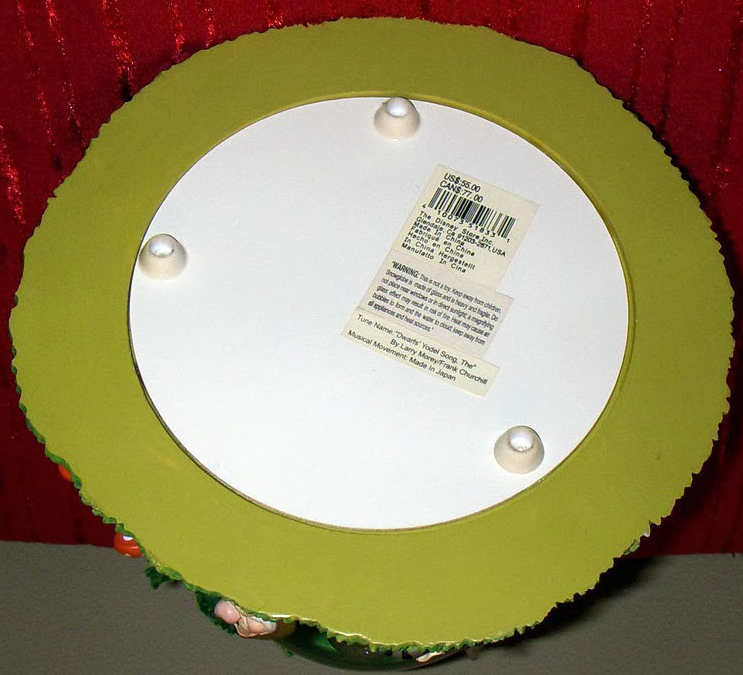 With most musical globes, a turn-key is found on the underside to activate the tune. 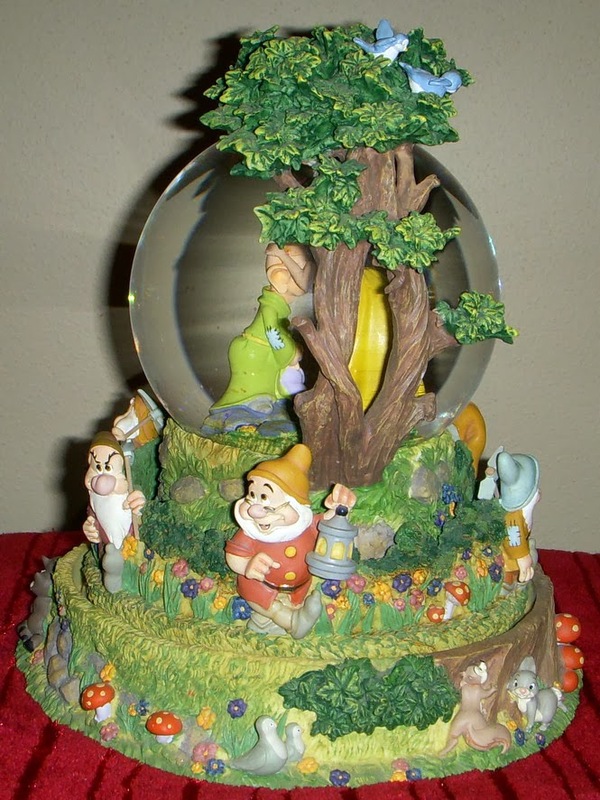 However, this one has an unusual winding mechanism--you turn the base where the Seven Dwarfs are located. As it plays, they circle the globe. 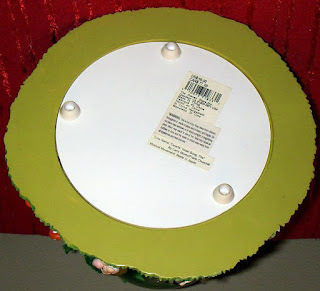 Measures approximately 8.5" high. Dates from 2001. Original retail $55 USD. Additional image and info courtesy of Disney Snowglobes Collectors Guide. 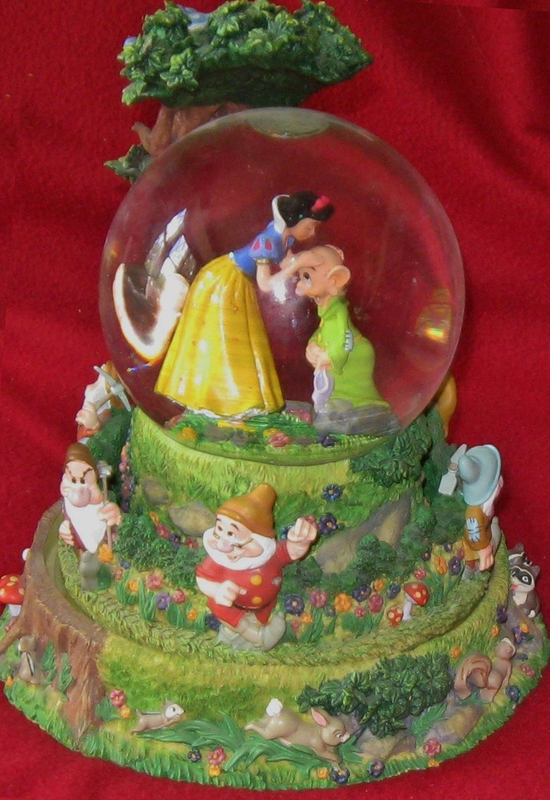 Snow White finds herself in the arms of the Prince as the dwarfs celebrate around the base of the snowglobe. Glass and resin. Approximately 9" tall. 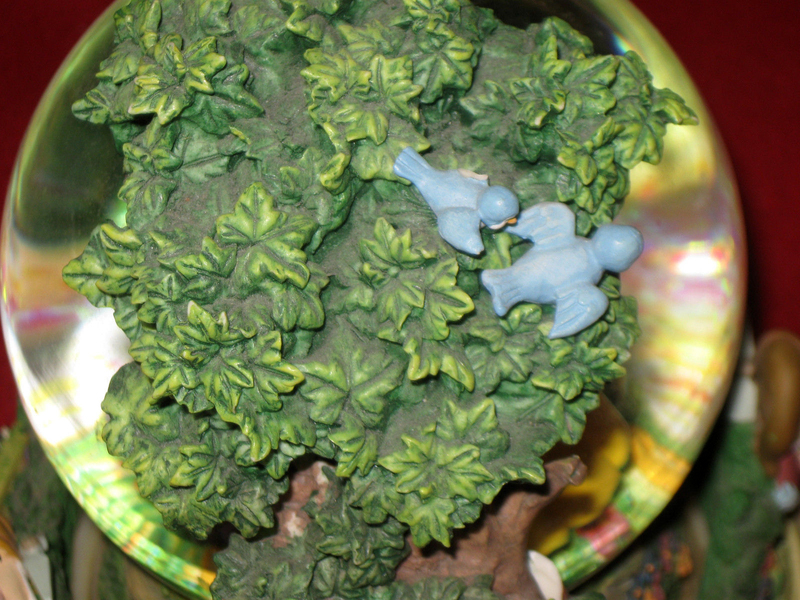 Plays Someday My Prince Will Come. Includes battery-powered blower. Sold at the US theme parks. Dates from 2007. Retail $85. The development of Disney's Snow White and the Seven Dwarfs was first disclosed to the world by Walt himself via the New York Times in June of 1934. 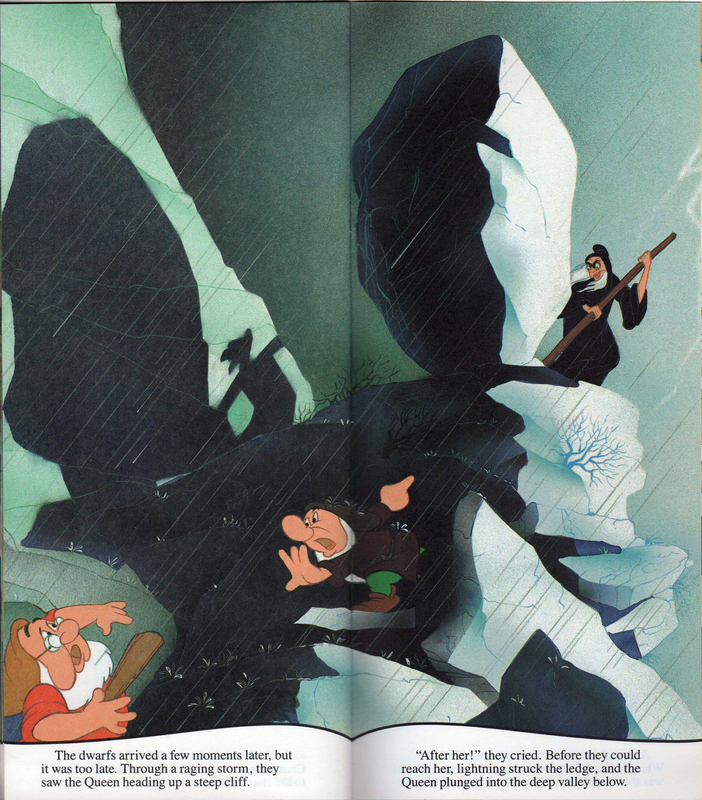 This was also the year that Max and Dave Fleischer had wanted to counter Walt Disney's announcement and begin work on their own animated feature at their New York-based Fleischer Studios. 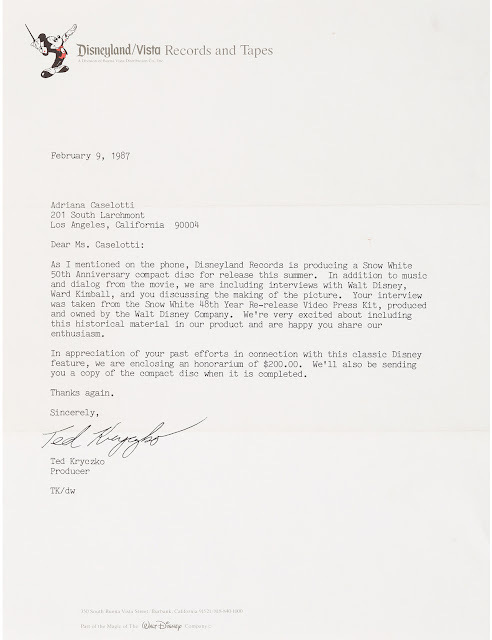 Their aspirations were thwarted, however, by the Paramount suits who refused to support and distribute anything other than the Fleischer short cartoons. Yet, with the massive success of Disney's Snow White premiere in 1937, the Fleischers finally got the green light in the spring of 1938. Grim Natwick, the main animator on Disney's Snow White character, returned to the Fleischer Studios to be a part of this feature. Working for the Fleischers was nothing new for Natwick as he was the original animator of their Betty Boop series back in the early thirties. 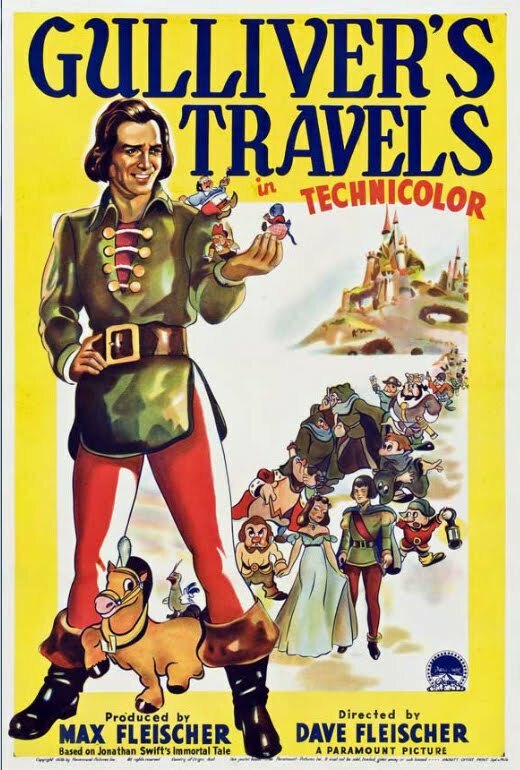 On December 22, 1939, Paramount Pictures released Fleischer Studios' Gulliver's Travels, and like Snow White, it turned out to be a box-office success. 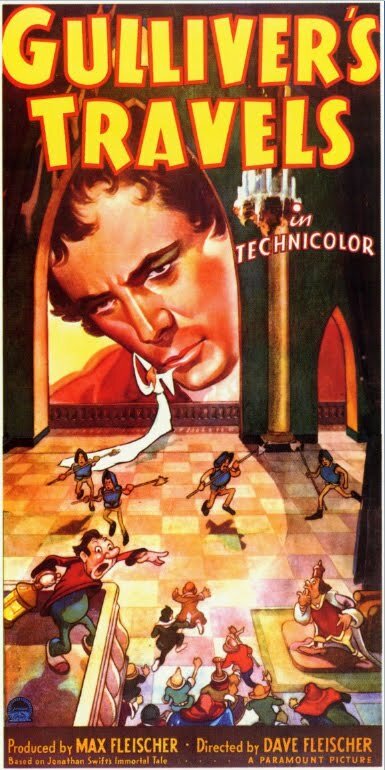 The film is now in public domain. 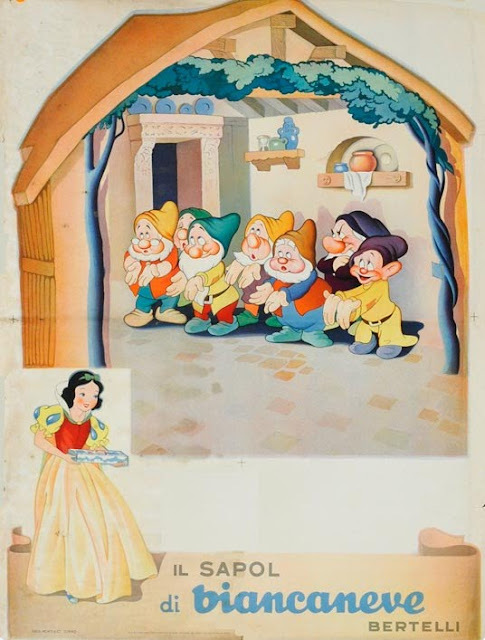 Folded Snow White poster from Italy, coinciding with the film's original 1938 general release. An advertisement for Sapol bar soap from Bertelli. Poster dimensions: 21" x 27". See the soap bars in their original packaging in a later Archive entry. 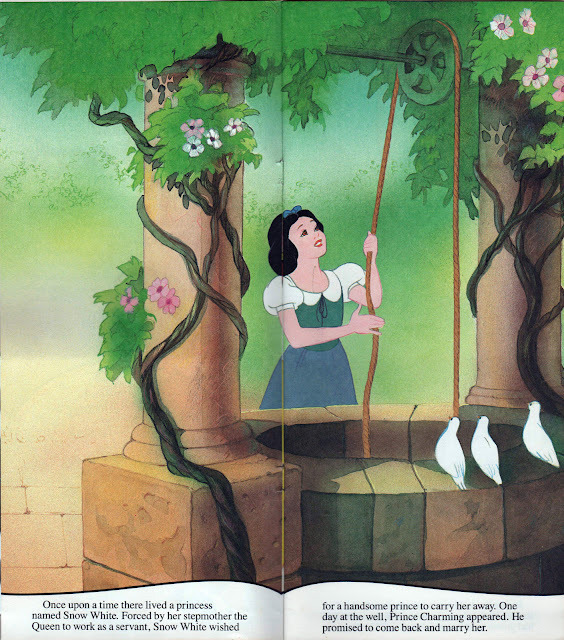 This is the start of a couple new blog series on Snow White costumes. 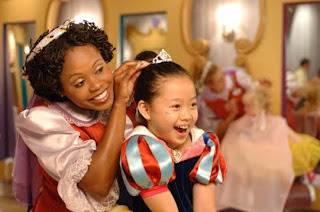 One group of posts will feature images of Disney theme park cast members dressed as the princess. The other will focus on non-cast Snow White costumes that may include celebrities, Halloween gatherings and anywhere else one might find people adorned in the princess attire. 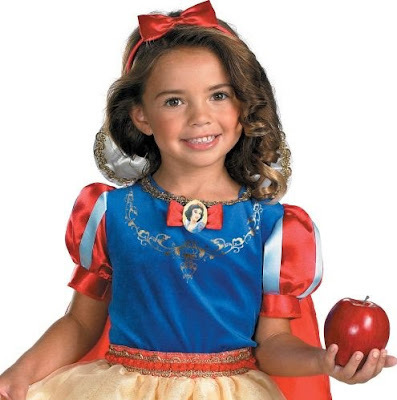 A Disney Princess Snow White Deluxe Halloween Costume for girls age 7-9. 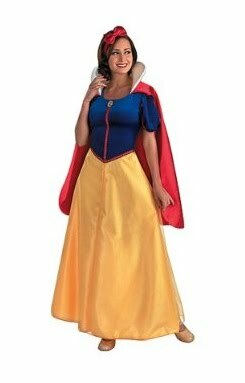 Retails on the Toys R Us website for $39.99 (USD) + an officially Disney-licensed Women’s Snow White Costume sold (but no longer available) at Target stores (catalog #10302480). 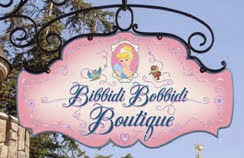 Bibbidi Bobbidi Boutique is a rather unique salon located inside Sleeping Beauty Castle at Disneyland and Cinderella Castle at Walt Disney World, plus in the World Of Disney store at Orlando's Downtown Disney area. Girls get a royal makeover into their favorite princess, for a price. Halloween in Hollywood brings out the stars. 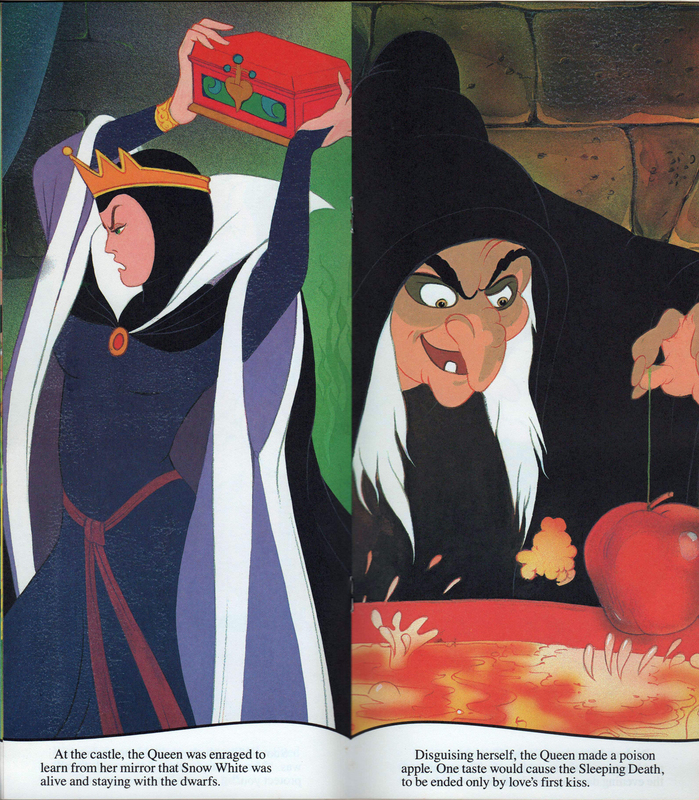 Here Michelle Trachtenberg is Snow White (with Lydia Hearst as a sort of vampire-ish fairy). In an earlier Archive entry, we saw the Snow White story and soundtrack CD from 1987. Two years later in 1989, it was reissued in the United Kingdom on the Pickwick International label. Catalog no. DSMCD 456. Features both music and story. Narrated by Hal Smith. Bonus tracks include interviews and deleted song. Compact disc only, no read-along book. In 1987, Disneyland/Vista Records and Tapes released a Snow White 50th anniversary CD (see previous post). 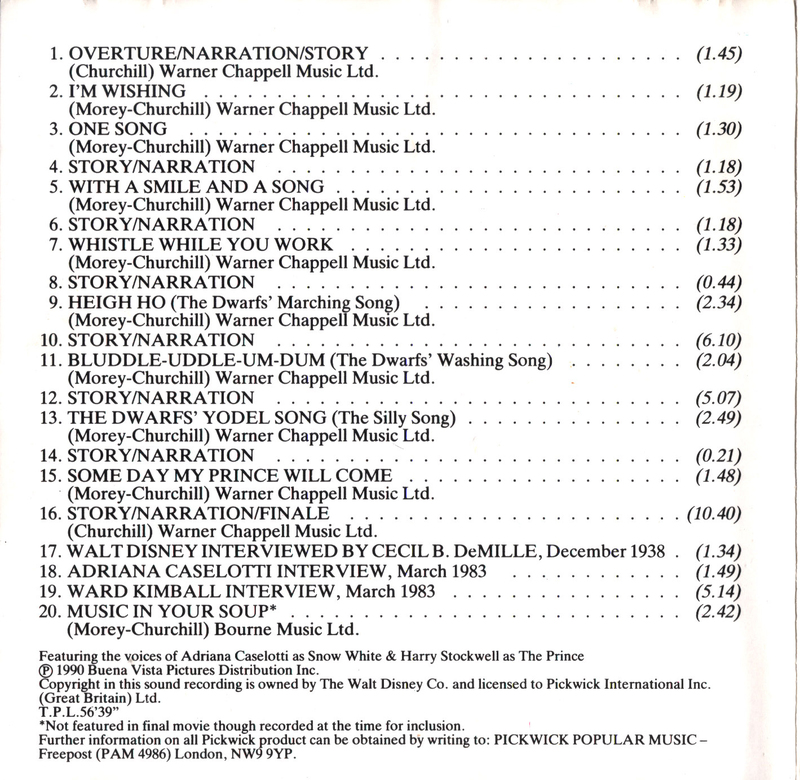 The recording included bonus interviews with Walt Disney, Ward Kimball, and Adriana Caselotti. 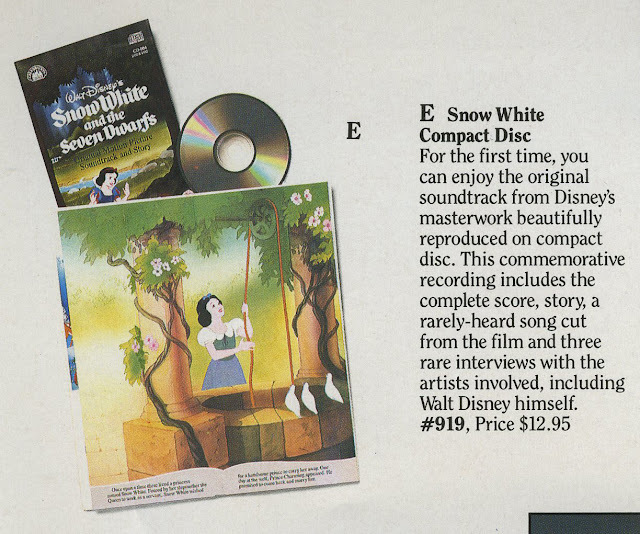 In this letter from the producer of the disc, Ted Kryczko, we learn that her "interview was taken from the Snow White 48th Year Re-release Video Press Kit." As a token of appreciation, they sent Adriana a payment of $200 for material to be used. 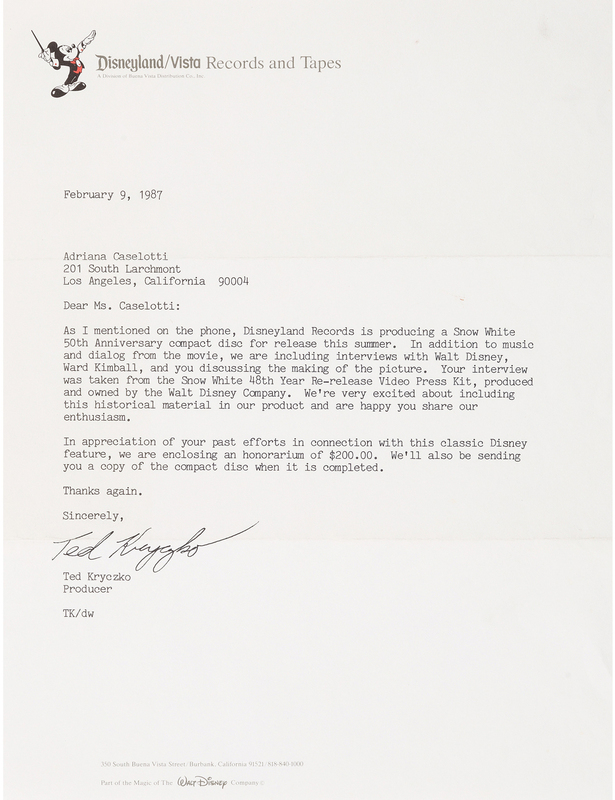 The letter is dated February 9, 1987. First time on compact disc! 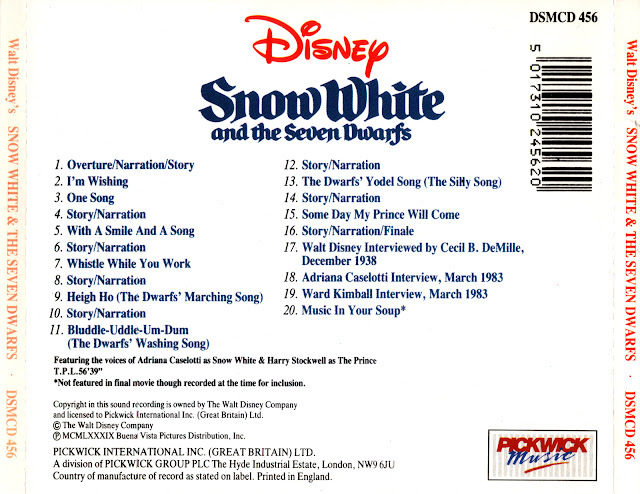 Snow White Celebration Series CD from 1987. Catalog no. CD-004 (DIDX 1455). 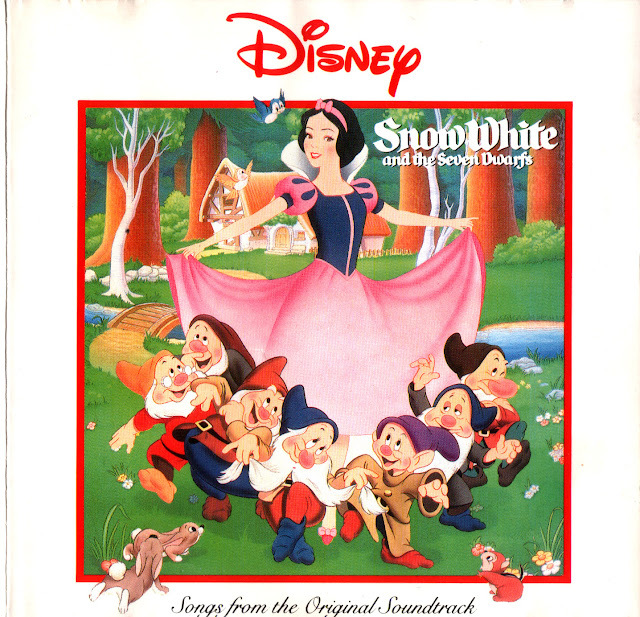 The audio features the musical movie soundtrack interspersed with the narrated story presented by Hal Smith (first issued on LP in 1980, record no. 3906). 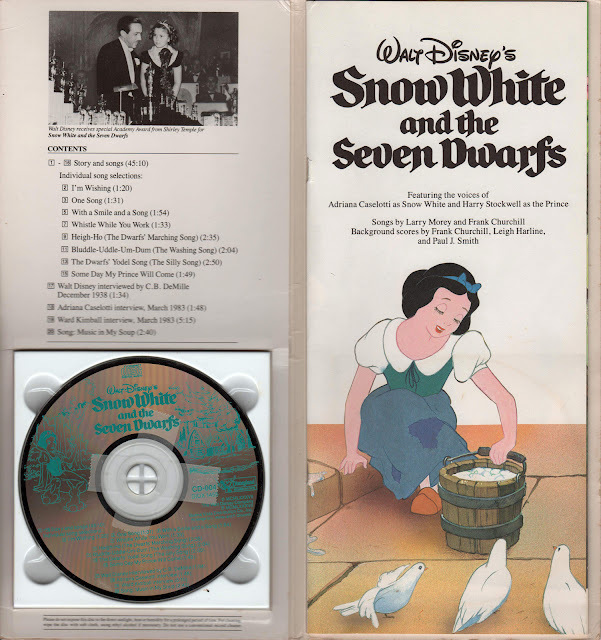 Also included are interviews with Walt Disney (by Cecil B. DeMille, excerpted from Lux Radio Theatre), plus Adriana Caselotti and Ward Kimball. Bonus deleted song Music in My Soup. 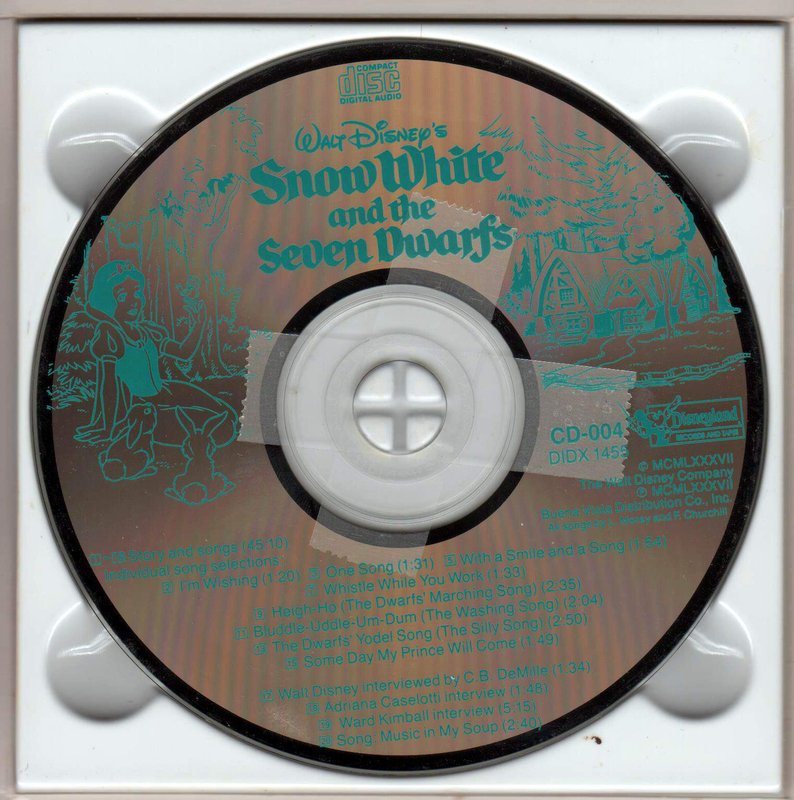 CD housed inside 24-page full-color book. CD/book images courtesy of the Greg Philip Collection. 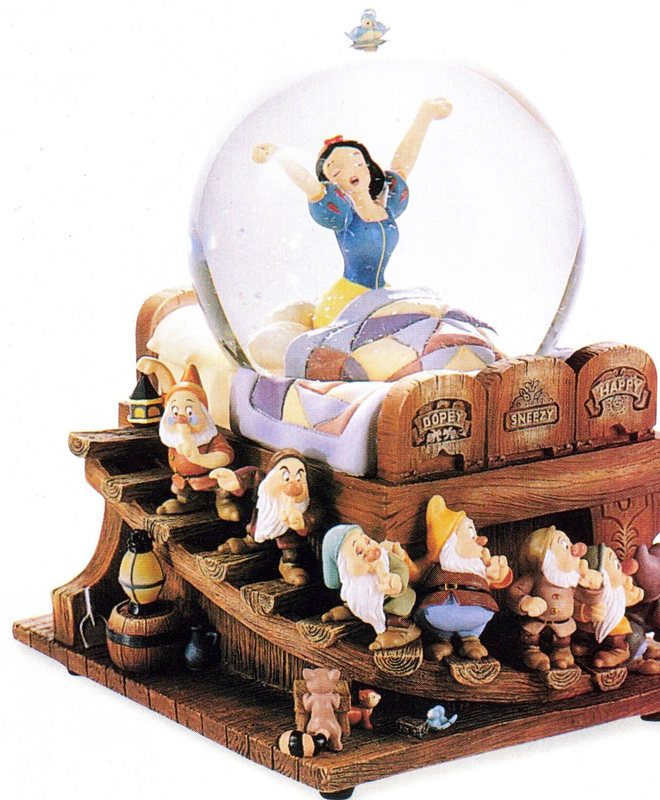 The set was listed in the 1987 Walt Disney Family Gift Catalog (p. 3). Retail price $12.95. Catalog scan courtesy of the François Monferran Collection. In the next Archive entry, we look at a letter to Adriana Caselotti from the producer of this disc. 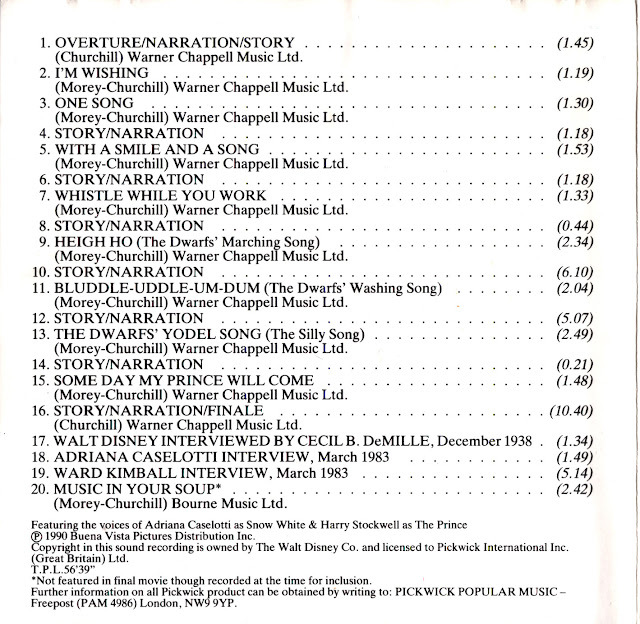 In 1989, the recording was repackaged as a CD only (no book) and released in the United Kingdom. See it in an upcoming post. A [Dave Smith]: The Witch in the cage was originally made by the former WED Display and Design Department at Walt Disney World, under Jim McNalis, for use in 1975 Emporium windows in the Magic Kingdom park promoting Snow White and the Seven Dwarfs. 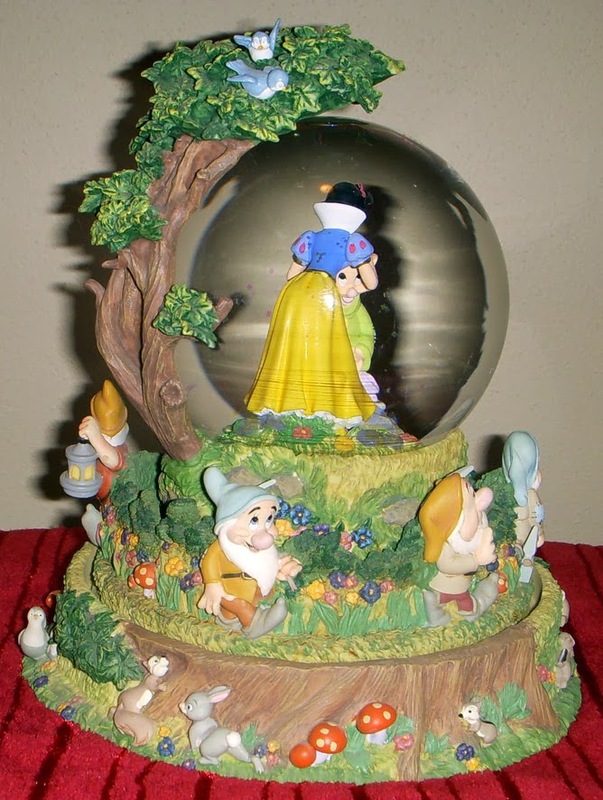 When the Disneyana Shop opened on Main Street, U.S.A. at Disneyland in 1976, the Witch, animated and with added audio, moved west to become a major display piece in that shop. Later on it was used in the Villain's Lair shop in Fantasyland and Le Bat en Rouge in New Orleans Square. 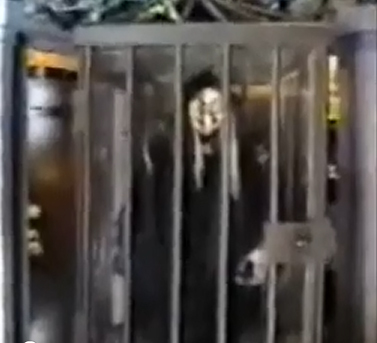 That Old Witch was in the cage at Disneyland's Main Street's Emporuim when I was 11 in 1977. My dad, being that he was not shy, asked a cashier if she was for sale after I BEGGED him to see. The woman brought a manager out who quoted him $5000.00. We passed, obviously. 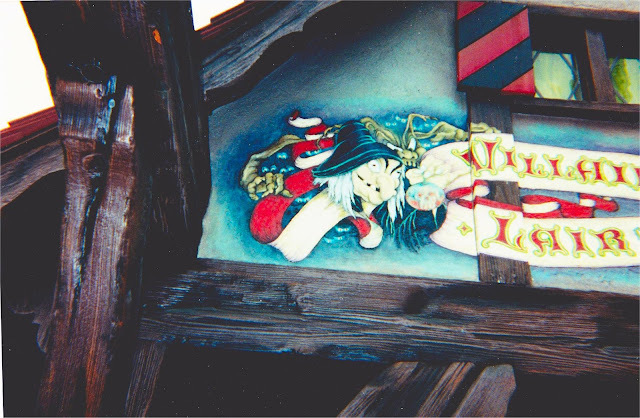 A Witch mural, based on Gustaf Tenggren's original inspiration art, could also be seen at the Villain's Lair shop in Fantasyland from approximately 1998-2004. 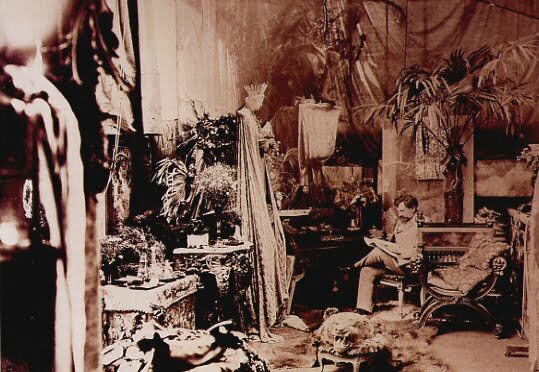 Image courtesy of The Raymond Collection. 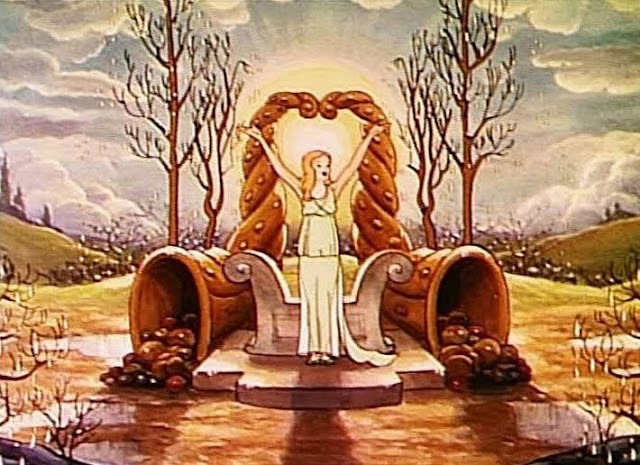 What could be better than the Silly Symphony return of Persephone here on the Spring Equinox? It is well known that in 1934, three years before the release of Snow White and the Seven Dwarfs, Walt Disney's The Goddess of Spring served as a testing ground for his animators. Since they'd had only limited experience with drawing believable human characters, practice on Persephone would eventually lead to perfection--but not at first. 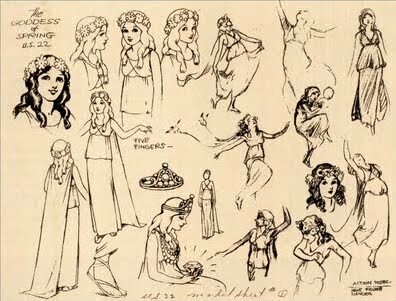 The characters were designed by Albert Hurter [the studio's first inspirational sketch artist], who suggested certain poses and gestures that the animators were not yet skilled enough to emulate. 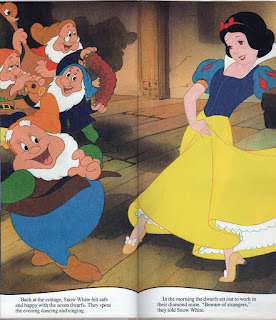 After realizing that a greater knowledge of anatomy was required in order to produce believable human animation, [Walt] hired Don Graham, who held anatomy classes in order to prepare the animators for their first feature. Artist Model Sheet. Copyright Disney. 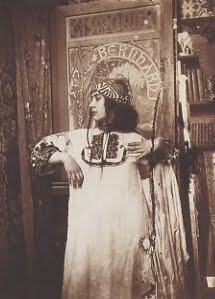 The Vernal Equinox is fast approaching here in the northern hemisphere and with it comes images of the Goddess of Spring, Persephone. 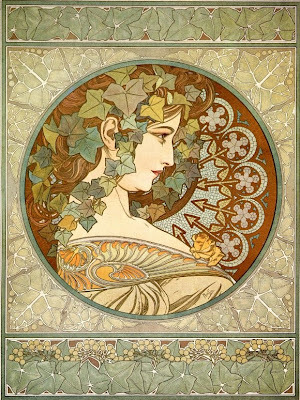 Let's revisit a couple of the "goddess-themed" works of Alphonse Mucha, one of the main visionaries responsible for the birth of the Art Nouveau movement during the late 19th and early 20th century. Many of his works evoke a certain female deity appreciation. 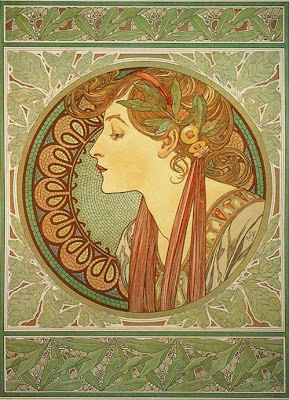 Two in particular, Ivy and Laurel, could have been patterned from subjects right out of the Greek Pantheon. Just over a century after Mucha created these two lithographs, it appears that the Disney artist who designed this 2004 Snow White pin was influenced by the original pieces. 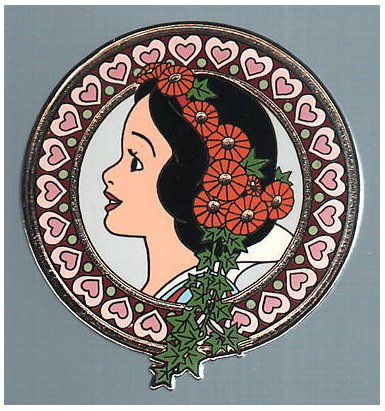 "Halo of Hearts" Princess Profile, limited edition 1,000 gold-finished pins, Disney Auctions, 2004. 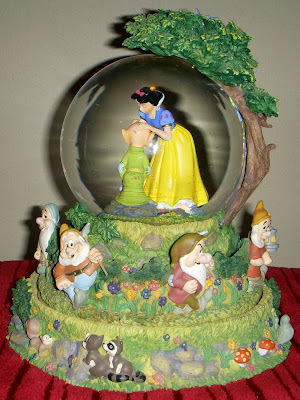 I'm certainly a fan Snow White depictions in goddess form. See another 2004 princess deity design in earlier post. Holland has some lovely sandy shores along the English Channel. 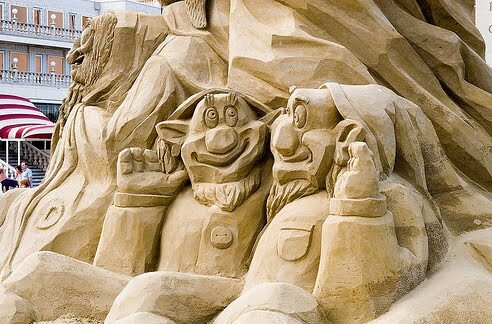 So much so that every September, the town of Noordwijk aan Zee with its 12 kms of beach hosts the European Sand Sculptures Festival. 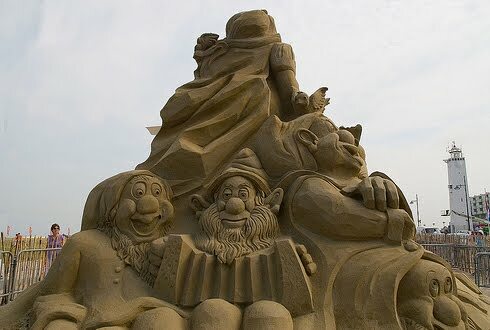 The event attracts some of the best sand artists from around the world as well as over 200,000 visitors. 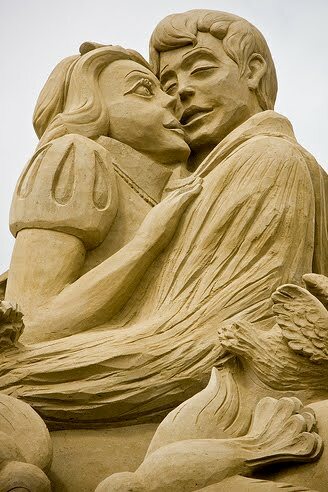 The international carving teams create beautiful, grand, yet fleeting works of art. The results are stunning. 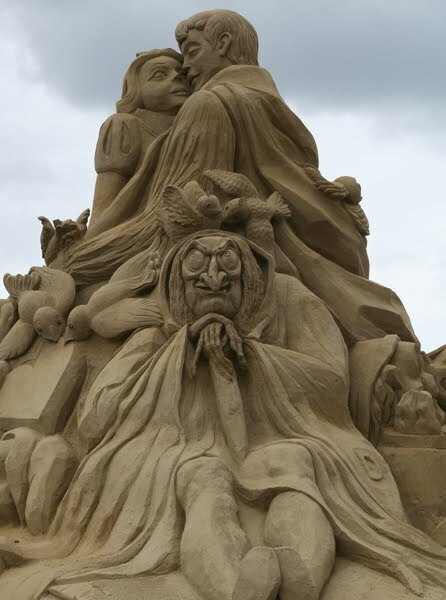 The sculptures evoke something reminiscent of Tibetan or Navajo sand paintings, not in style, but in the impermanence and almost spiritual nature of the artwork. 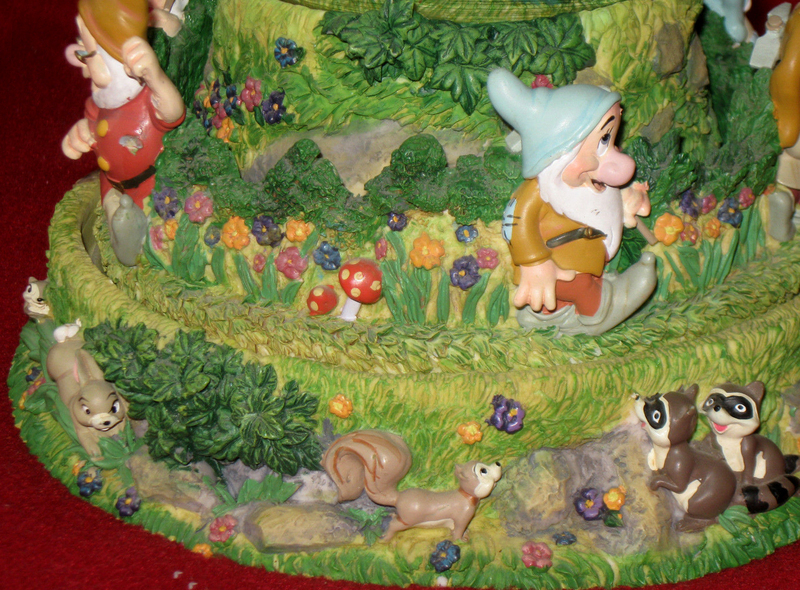 In 2008, eight carving teams had the task of creating sculptures, all with a Disney motif. A number of them were princess-themed, including one of Snow White and the Seven Dwarfs. 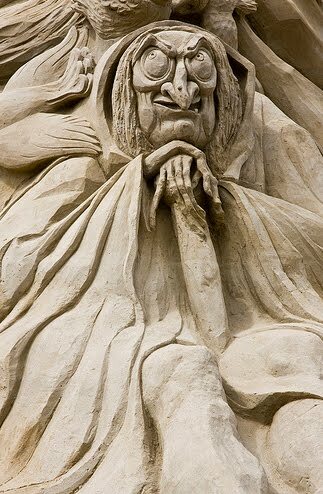 Sculpted by Jiri Kaspar, Jakub Zimacek and Olga Kolot. Snow Boop?...or Maybe Betty White?